A trip to Havana is a real time travel. Havana cannot boast of excellent Internet or smartphones. Well, do you really need them that much? Fearless Cubans are running their old cars all over the Havana. It seems that their cars are run by Cubans’ energy, temperament and cheerfulness, instead of gas. Perhaps, this endless energy and the hot sun make Havana Ernest Hemingway’s favorite city, who spent most of his life in Cuba. What can be more romantic and relaxing for a man who met his beloved on a j4l.com, than a little vacation in Havana? Many of the bars Hemingway used to visit (actually he almost lived there), are open and are doing great today. “Old Hem,” as Hemingway was called in Cuba, made much more than it may seem to for this country. After all, his fame brings thousands of tourists to Cuba. Yearly they gather in bars to grab a drink or two and find out “For Whom the Bell Tolls”. We have come up with four favorite places of the glorious Ernest. Therefore, we invite you to make virtual trip to Havana, the beloved city of the great writer. The two of Hemingway’s beloved bars are known for a couple of specific drinks. At that time, cocktails were almost in American drinks menus (and this, by the way, in the 1920s). Fortunately, Cuba already knew how to make a delicious alcoholic cocktail of strong alcohol, and nothing has changed since then. Floridita is the Cradle of Daiquiri. Daiquiri was definitely created in Cuba and became a masterpiece here. They offer several types of the famous cocktail, depending on your preferences (Hemingway, by the way, had it without sugar). However, the traditional Daiquiri at Floridita includes rum, sugar, ice, lime and cocktail liqueur. In the video below, one of the bartenders makes this famous drink at this famous bar. The bar has worked here since 1817, and got its modern name Floridita in a century. After another hundred years, the bar looks the same as it was in the 1950s. The secret of their today’s popularity is simple: a musical band playing Cuban music, a monument of “Old Hem” and a refreshing Daiquiri. Besides, it is pretty hard to resist having a drink at a bar when it is 35 degrees outside? If the Floridita is a light fantasy, then the La Bodeguita del Medio is a total immersion. There is no air conditioning in this tiny bar in Old Havana. Instead, half the front wall is simply missing, and the old fans are moving the hot air from one corner of the ceiling to another. 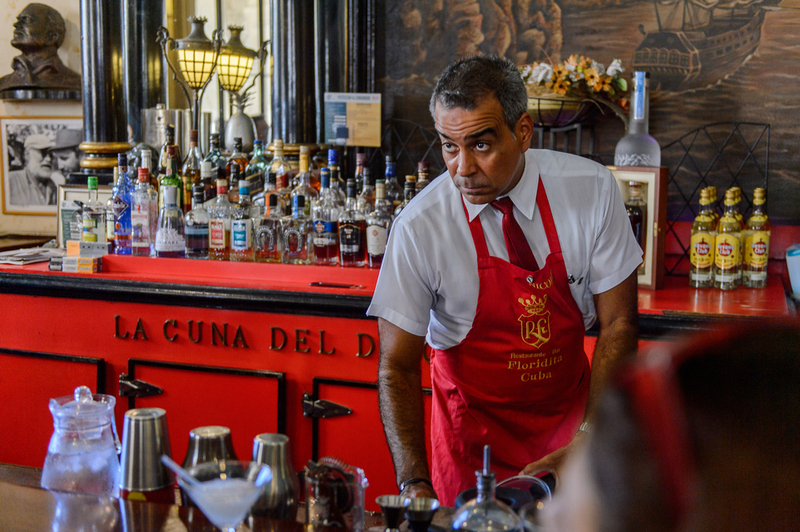 You will need your best luck to find a seat at this tiny bar of Havana. And although they have a restaurant at the back (with a much bigger space), the biggest fan with live music goes near the entrance. La Bodeguita del Medio claims that their bar gave birth to Mojito. And, if you have never really liked mojito, you will change your mind as soon as you arrive in Cuba and visit the Bodeguita bar. The regular problem with mojito in many bars: for some reason bartenders believe that mint should be chopped, and this tastes drinking water in a pond. The right cocktail (and Bodeguita serves the right one) includes mint to make the drink taste fresh and aromatic, but does not include swallowing the mint leaves. One mojito – and you will come back again and again. Another bar, higly visited by Hemingway in Havana, is called Dos Hermanos (translated as “Two Brothers”). The bar lies along the embankment in Old Havana. 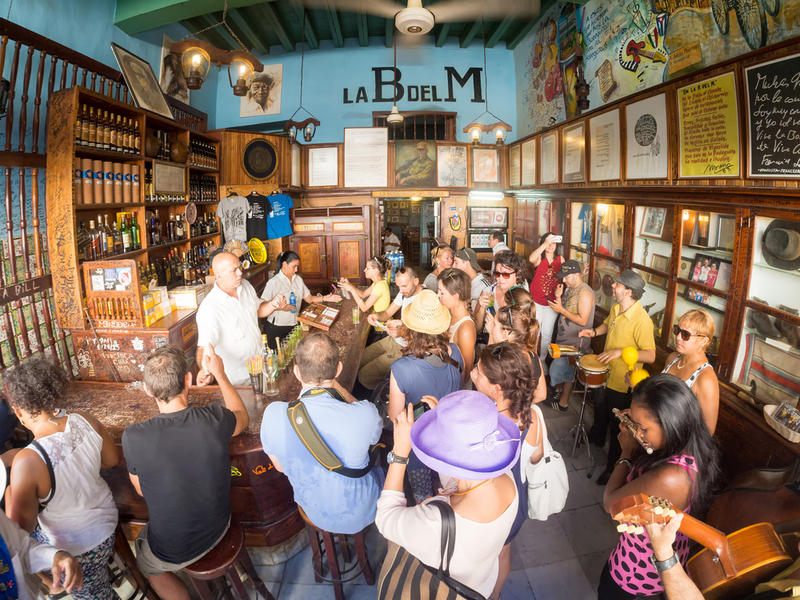 Dos Hermanos is located close to the Rum Museum “Havana Club” (El Museo del Ron Havana Club), which makes the bar an ideal stop for romantic couples to take a breath after the tour. Being a spacious bar with large windows overlooking the promenade, the Dos Hermanos is one of the oldest bars in Havana. The bar does not offer any special branded cocktails, but you can’t go wrong with a cocktail in Cuba if there is at least one drop of rum in it. Drink for the freedom of Cuba a Cuba Libre cocktail, which includes Rum and TuKola from Ciego Montero, the Cuban equivalent of Coca-Cola. The Sloppy Joe’s combines the history of Havana and its promising future. For decades, it has been popular among different U.S. celebrities. After the Cuban Revolution, the bar was closed, but after a long restoration, the beloved Cubans (and not only) reopened it 2013. Photos of Ernest Hemingway were joined by those of celebrities who visited Sloppy Joe’s, including John Wayne, Ted Williams, Babe Ruth, Frank Sinatra and even Adam Sandler. 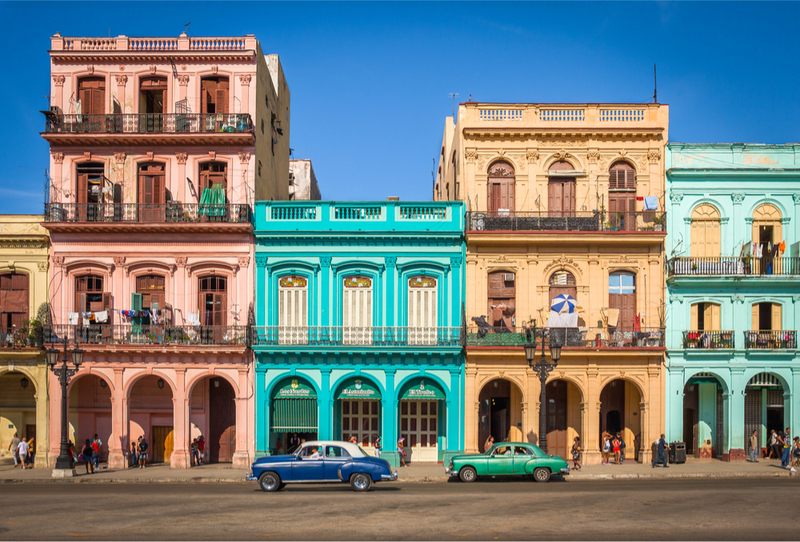 If you want to see classical Havana in the middle of the 20th century, the best way to do it is by immersing yourself in literary traditions and following the glass of fine Cuban Rum and the ghost of Old Hem through the whole of Havana.